Mum's calling : Snowboarding and Skiing is Fun! Last weekend, together with our large kampong of 16 adults, 9 children and a dog, we trooped off for some snowy sports at Sierra, Lake Tahoe. 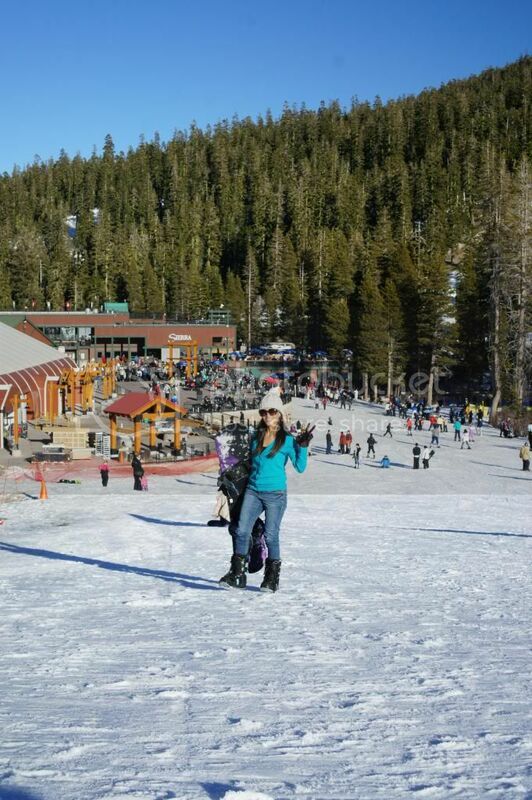 The man and I had our first snowboarding experience, and Jazz, her first ski experience. I didn't think she would continue to be keened after doing a 3 hours lesson on day 1, but my instinct went wrong. She was all so excited and anticipated for the next lesson, after her first. While I accumulated bumps and bruises during my lesson, Jazz did well and steady throughout hers. How superb if they exceptionally allowed me into their tenderly taught lessons. Junior class seemed a better fit for me. It was interestingly fun on how Jazz related her lesson guide to us. The travelator that brought them up slope is called the 'Magic carpet.' The 'A' sign that their ski should make to a halt is called 'Pizza.' And parallel ski, called 'French Fries' was not good for stopping. 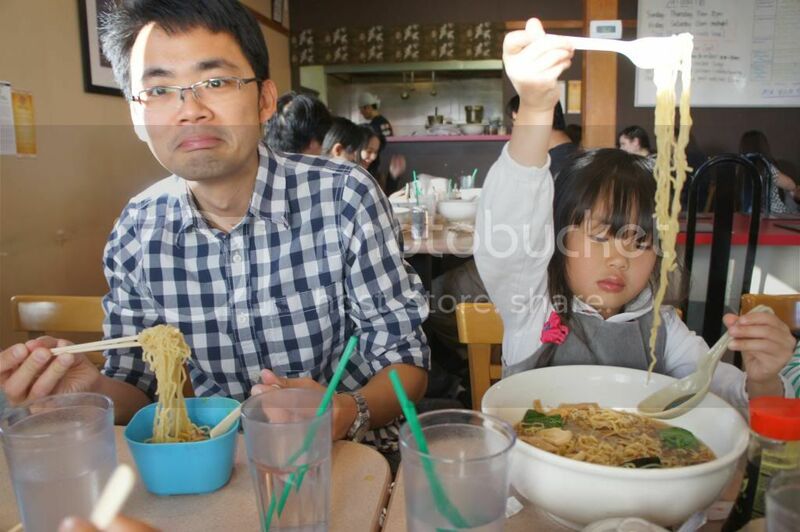 It sure got the kids hungry while learning. I'm glad she enjoyed her lessons the fun way. 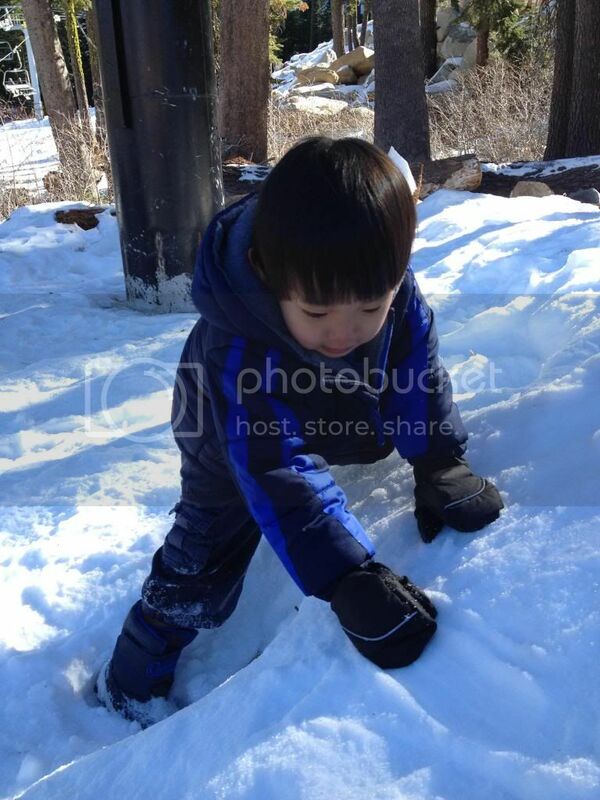 While Jazz expressed interest in skiing, Jare showed no interests to glide with equipments on snow. We took turn to babysit him, played snow and loitered around while waiting for each other to be done with lesson. At the end of our trip, I gained some interest in snowboarding, but definitely not some talent to advance in it. Having done some basic skiing many years ago, I affirmed that skiing seemed easier to comprehend than snowboarding. Nah, not my excuse. The man, with more talent, flexibility and agility, had better stunts to flaunt on his snowboard. I think he has developed deep love for it. It was a very great experience and wonderful opportunity to glide on snow with style, but everything got messed up when we failed to maneuver obstacles and humans, or halt the proper way. Fall to stop was my motto, and best, was to fall gracefully. Snow sports can get pretty addictive. The fact of it being unfounded in our homeland, gave us good root reason to bond with it here. It was a pity that Jazz can't pursue skiing when back, but she sure had a good appetizer for the sport. While time is ticking away, we are planning to go for more! You guessed it, she couldn't finish it. Haha.